Good coverage of migration and detention at the U.S.-Mexico border requires a few things. First among them: sending reporters there. 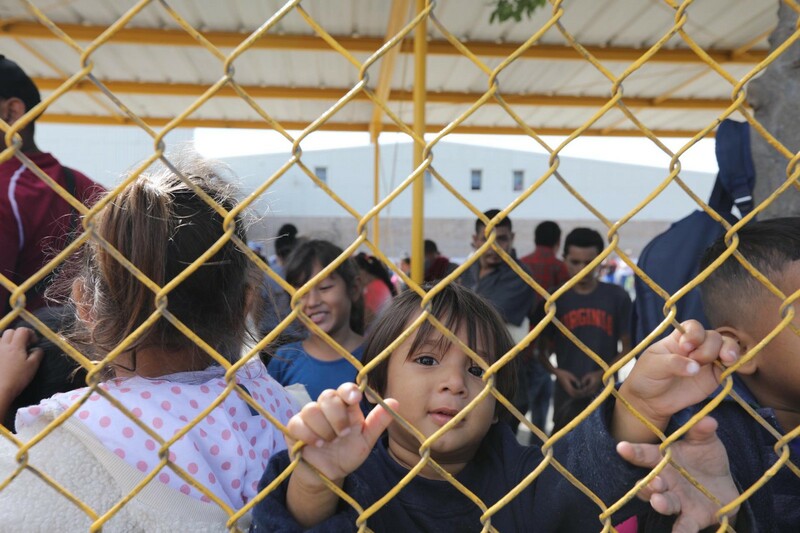 A child looks out from a fence at the Piedras Negras border crossing. Photo courtesy of Alice Driver. Prompted by Donald Trump’s demand for a border wall and his fraudulent declaration of a national emergency, many media outlets have recently doubled down on their immigration coverage. But that doesn’t necessarily mean more journalists are being sent out into the field. Instead, many outlets keep their journalists in newsrooms, where they use the internet and telephones as primary reporting tools. This absence from the field can create a number of ethics and transparency issues, especially when the subjects are marginalized and vulnerable populations. Alice Driver, a veteran journalist, does things differently. She reports on migration from the border, cultivating relationships with the communities she writes about and reporting back details that other journalists might miss. She has reported on migration for Time, CNN, Longreads and The Daily Beast. I recently spoke with her about her work. Our conversation has been edited lightly for length and clarity. First, how has Trump’s “national emergency” affected conditions on the border? There’s nothing happening on the border. Migration from Central America is at an all-time low right now. What’s happening is that Trump is attempting to change asylum policy. He’s essentially limiting or not letting migrants request asylum. So, there’s a build-up of desperate and angry people on the border, which makes Americans think apparently that there’s mobs of scary people [there]. But the reality is that the numbers are down. The only real emergency is we’re violating international law by not letting people request asylum. Migrant shelters are full, because people haven’t been allowed to go through a due process that they normally go through, which would be requesting asylum. At Piedras Negras, it appears that Mexican and American agencies are now working together to lock up migrants before they even reached the border. They locked up a group of about 1,800 migrants in an old factory they used to produce body bags for the U.S., ironically. [The scenario] produces a lot of questions. For example, is it legal to just round up migrants and lock them up in some random place? So, we went there, and I went to the factory. It’s surrounded and heavily militarized. You’ve got U.S. helicopters overhead, you’ve got Mexican military, Mexican police. And then on the U.S. side, you’ve got all kinds of U.S. agencies and the Border Patrol, and it just was like — are we really getting together the forces that we would send to war so that we can lock up migrants? What kind of techniques do you use when you’re reporting on migration? I’m interested in on-the-ground interviews with migrants, focusing on women, girls, the LGBTQ community. I want to be the perspective of someone who’s in the location, who’s interviewing migrants, because I see a lot of reporting — done from Washington, D.C., from New York, from a desk on the phone by people who have never been to Mexico and who don’t speak Spanish — [and they end up saying things like] “migrants are so happy at the shelter; they have a soccer field.’” I mean, if you got locked up against your will, would you be happy? You need to actually talk to migrants about their situation. Obviously, not everyone can go to Piedras Negras. And I don’t at all blame reporters, because the journalism landscape right now is that outlets are not investing in journalism. They’re not going to pay for you to go to Piedras Negras. They’re not going to pay your expenses. So, it’s no wonder so much reporting is done from from a desk. I think it says something about the state of journalism and what outlets are investing in. What advice would you give to journalists who are interested in doing it more your way, on the ground? The first thing I would say is, you need to learn the language. There are so many people who report on migration who don’t speak Spanish, and I do think it’s a loss, because learning a language is actually not difficult. I don’t know why in the United States, we seem to be dead set against learning languages. So, I would say learn [Spanish] and start working and traveling in the communities that you’re interested in writing about, because having contacts and having context for what’s going on. How do you handle reporting on marginalized people and sensitive topics? Reporting on marginalized people and vulnerable populations is a long-term investment. It’s a lifelong commitment. It’s an interest. It’s something that I have studied and researched and lived and that I’ve invested my life in. And I think that makes a difference, because people want to feel that you respect them, that you treat them as equals, and part of that is speaking their language. Part of that is understanding their cultural context. Part of that is having lived or traveled with them, and understanding for example, what it’s like to live in a migrant shelter, what it’s like to travel as a single mother with three children [across a desert]. Have you had any issues come up with source privacy? Usually, publications that are publishing on migrants are respectful of the fact that they might need to be an anonymous source. I always let people I’m interviewing know that they can choose to talk to me anonymously or to only use their first name. They don’t have to have any photos, and if they don’t want to tell their story, then I don’t press the issue. For me, it’s another issue of respect. I’m not going to try and get a story from someone who doesn’t want to share it or who’s afraid that their life will be in danger. So, it’s more about treating migrants like people, like equals who can make decisions about the kind of story they want to tell and what their security situation is. Are there any other considerations that journalists should have when they’re reporting on marginalized populations? I think it’s just really important to do research. And to be aware. I’ve been working for a little over a year and a half with the trans community in Latin America, and I see a lot of reporters who show they haven’t taken time to understand the community. For example, it’s very offensive to push a trans person to give you their birth name. I see a lot of people do that kind of thing. There’s just a lot of sensitive issues that, if you don’t do research or talk to people beforehand, you’re going to have a difficult time doing reporting and doing it in a way that’s respectful. Who else do you think is doing a good job with the subject like the border? Are there any other reporters whose work we should be reading? There’s so much good reporting being done on the border right now. In terms of Piedras Negras, I’ve been following the work of a reporter at The Houston Chronicle named Lomi Kriel. I love Ginger Thompson, who is at Pro Publica. All the work being done on immigration issues at Pro Publica is just incredibly good. And Fernanda Santos, who used to be at The New York Times, but now she’s a teacher. She’s also writing some really beautiful, important essays about migrants and immigration and what it means to be a U.S. citizen. If somebody wanted to read more in-depth, are there any books that have come out recently or even in the past that touch on migration? Yes, one of my favorite authors right now is Valeria Luiselli. She is a Mexican author. She lives in New York, and she writes both fiction and nonfiction, and she’s done some really beautiful work on the subject of migrants. She just had a novel come out that was reviewed in the New York Times a few weeks ago, Lost Children Archive. Finally, are there any images from your recent reporting that have really stuck with you? I just think it puts this quote-unquote “emergency” in perspective, because there is an emergency, but it’s maybe not what the President is saying it is. We really need to think about how we’re going to treat migrants. Are we no longer going to allow anyone to request asylum in the United States? Is that the country we are going to be? Rebecca Renner is a freelance journalist who has written for Slate, the Washington Post, New York, the Paris Review, and many others. Find her on Twitter at @RebeccaRennerFL.